On the Comic Kingdom site on the 21st, “Tuesday’s Top Ten Comics on Language” (where language is understood broadly), with comments from the site. This is the strip Squirrel Girl, in the Marvel Comics universe. As Earth rotates in the summer, fireflies whisper sweet nothings to each other in the most beautiful language never heard. For millions of years the insects have called to one another secretly, using flashes of light like a romantic morse code. With some rather simple technology — a light and a battery — scientists have been decoding their love notes for years. But recently I learned that you don’t have to be an entomologist to try to talk to fireflies. 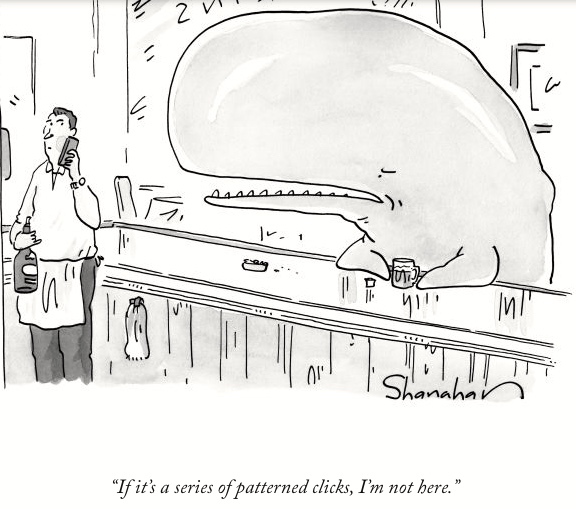 The Shanahan (which is, in a sense, “about” animal communication) exemplifies the cartoon meme of the animal in a bar (most often a dog, but many other animals have engaged in bar conversations); in this case, the animal in a bar is combined with a comic trope in which a bartender covers for a patron by telling a caller to the bar (clasically, the patron’s wife) that the patron isn’t there. The Steed is a bizarre bulletin in the news for penises. 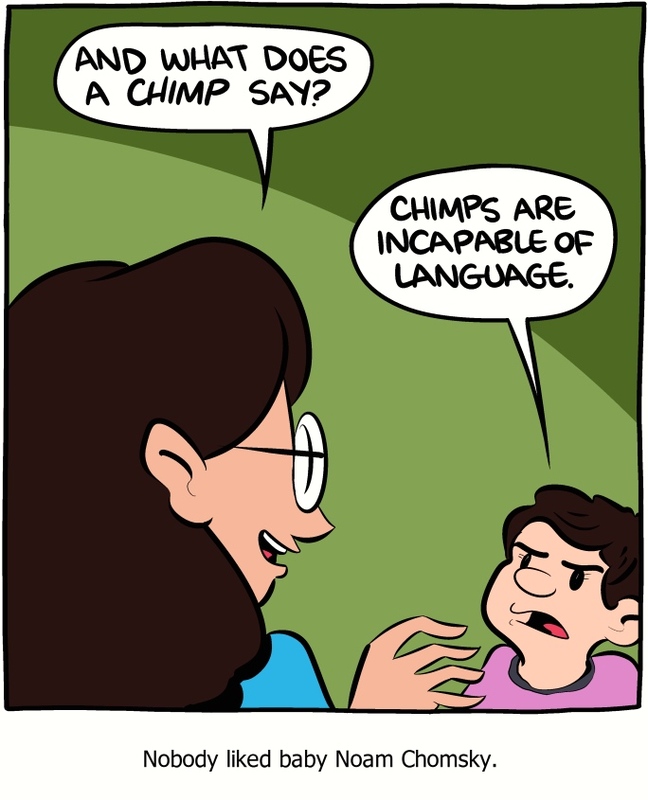 And no wonder: Baby Noam knows enough about Language to start a sustained argument that animals don’t have it, but not enough about the details of English to understand that the woman was asking what the conom (conventional onomatopoetic word — see discussion in the last section of my posting on Liam Walsh) is in English for the sound made by a chimp. (Note: there isn’t one, so far as I know). The facts of English usage in this domain are fairly complex, but little kids (other than Baby Noam, it seems) manage to cope very well with it. 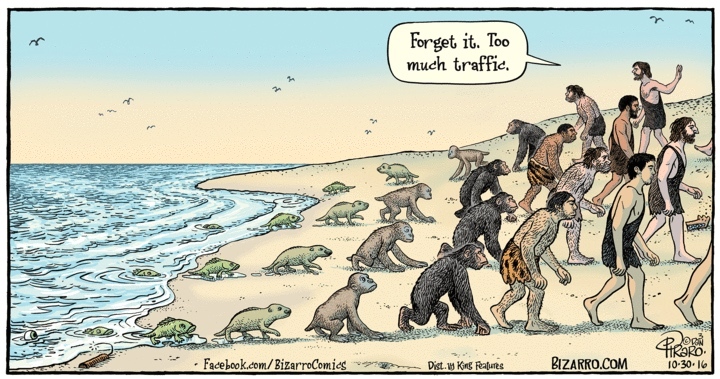 Paradoxical animal communication. 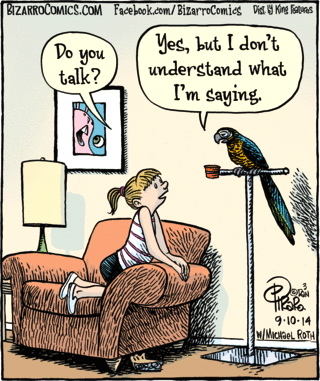 The parrot clearly understands the question and responds in English, while denying that it understands. 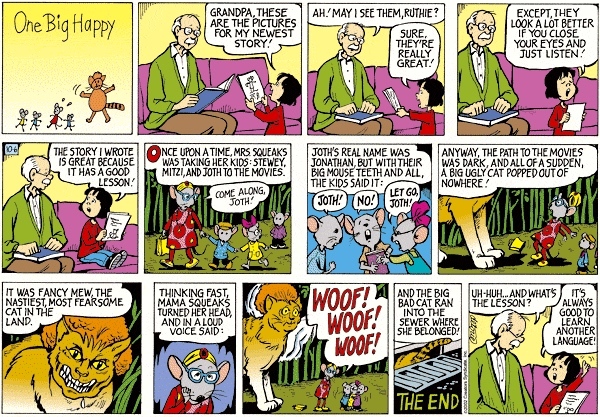 The conceit: The strip shows bulletins from Cat News, a program by and for cats — in particular, the three cats of Dunn’s household (Lupin, Puck, and Elvis). The cats view everything from their point of view, and the views of the humans in the household (known to the cats only as The Woman and The Man) are either irrelevant or inscrutable. Many cross-species failures of communication result, as in the fourth panel above, where Puck (the black cat) can’t understand why The Man stands in a closet to get clean when he has a perefectly good tongue. You are currently browsing the archives for the Animal communication category.